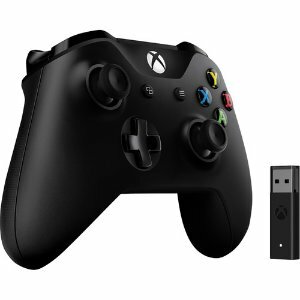 B&H offers the Microsoft Xbox Controller + Wireless Adapter for Windows 10 for $49.95. Features: It features a sleek, streamlined design and textured grips. Enjoy custom button mapping via the Xbox Accessories app. Plug in any compatible headset with the 3.5mm stereo headset jack. The Wireless Adapter features a 66% smaller design, wireless stereo sound support, and the ability to connect up to eight controllers at once. With the included Wireless Adapter, you can also play your favorite games on Windows 10 computers and tablets.